Highland Baptist Church is located one block off of Bardstown Road on Grinstead Drive. View HBC in Google Maps here or if you have Google Earth, you can use this link. 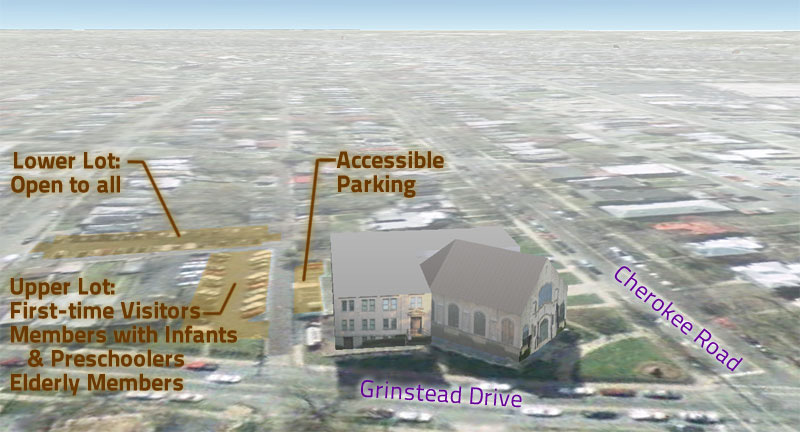 We have a wonderful challenge of fitting a growing congregation into our land-locked location in the historic Highlands neighborhood … which can make parking a touch confusing! If you are planning a visit to Highland, please take a few moments to review these maps to know your parking options. Our Transportation Ministry Group is constantly at work to make your parking experience at Highland one of ease and care. Highland’s on-site parking can be found immediately off Grinstead Drive, using the alley northeast of the church building. The map above designates visitor parking, handicapped parking, as well as parking for our senior drivers or parents with young children. We believe that God’s transforming Love is not limited to the number of our on-campus parking spaces! Please patronize these businesses and extend a ‘thank you’ on behalf of Highland for the generous use of their spaces. The following businesses along Bardstown Road have generously offered parking space for our members on Sunday morning for both services. If you are able, please park in these spaces and leave the parking lot for visitors, elderly, and those with small children. These spaces are available for our use until 12:30 p.m. on Sundays. Click on the image above for a larger view of the map. Using the rear mirror hanger showing that you are worshiping at Highland Baptist Church. Supporting the businesses that allow us to use their parking spaces. Letting the business employees know that you worship at Highland Baptist Church and thank them for allowing us to park in their lot! For more information about directions and parking at Highland, contact our church office at 502-451-3735.